A tale of espionage and mistaken identity in World War II, with a magnificent twist ending. I can't now remember the train of thought or conversation that took me in this particular direction, but I recently began thinking back to some of the monster movies I enjoyed on Creature Feature as a kid that I've never watched again as an adult. There aren't many--I think I might be pretty close to caught up in this department. has ensured a representation of B-movies from all genres. So I snatched up our copy of Tarantula and brought it home to watch. It's a good film. It's directed by Jack Arnold, who helmed a number of genre classics during the 1950s, including The Creature From the Black Lagoon, The Incredible Shrinking Man and It Came From Outer Space. Tarantula isn't quite as good as those, but it's still a pretty nifty film. 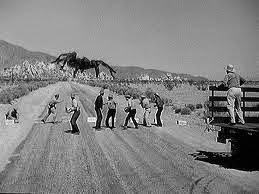 Like many other movies from the 1950s, it involves a creature mutated to gigantic size via radiation. But the interesting twist here is that the radiation isn't a result of atomic testing. Instead, a trio of scientists, working in a remote lab in the Arizona desert, are trying to develop an artificial nutrient and get rid of world hunger. They use a radioactive isotope as a binding agent to hold the nutrient's atoms together. I'm pretty sure this makes no sense at all, but Leo G. Carroll, (playing the only scientist who isn't dead soon after the movie begins) sounds appropriately authoritative when he explains it. 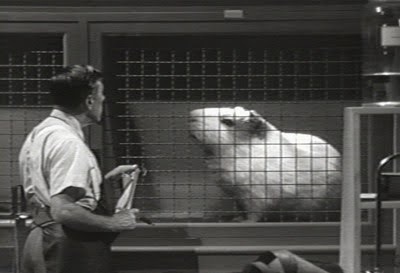 Whether or not the nutrient will eliminate hunger, it is good at getting test animals to grow really, really big. This includes a tarantula, which is presumed to have burned up in a lab accident, but actually escapes into the desert and keeps growing. A young growing spider needs plenty to eat, so its diet soon includes cows, horses and the occasional human being. Arnold keeps the story moving along. Even though the spider doesn't go into its full-on rampage until pretty late into the film, the plot unfolds in a suspenseful manner. There's an effective sub-plot involving Carroll's character. He's slowly dying (with his face gradually becoming deformed) after himself being infected by the nutrient. This also helps keep us interested until the spider antics begin. When the spider does start rampaging and getting closer and closer to town, it's time to call in the big guns. Pay close attention to the finale if you watch this film. Killing a giant spider doesn't just require jet fighters and modern ordinance. It requires jet fighters, modern ordinance and Clint Eastwood. "Have I fired six napalm rockets or only five? In all this confusion, I've lost count." John Agar plays the lead--a small town doctor who is the first to figure out what's going on. Agar was an actor who was never in danger of having to write an Academy Award acceptance speech and in many movies, he was incredibly stiff (The Mole People). He was usually more effective as a supporting character in films such as Fort Apache and The Sands of Iwo Jima. But he occasionally did quite well as the lead character. His most notable performance is the under-appreciated 1950 war movie Breaththrough. He's pretty good in Tarantula as well, coming across as intelligent and likable. Well, mostly intelligent. Here's a safety tip: Don't leave a dying elderly scientist and an attractive graduate student alone in a remote desert lab if you even suspect there might be a giant spider running around. And when you find a pool of liquid near some human bones (a pool of venom, it turns out), for gosh sakes don't taste it while trying to figure out what it is. Gee whiz, John Agar, its no wonder Shirley Temple left you in real life! Mara Corday is the female lead, playing a graduate student working for Carroll. She would be encountering giant arachnids again a few years later in The Black Scorpion. Some women need to stay away from the desert. I've been trying to think if there are any other films from my childhood I haven't re-watched. There are undoubtebly a few that I don't remember at all--just because a movie is old doesn't automatically mean its good enough to remember. But in these days of DVDs and streaming movies, it's getting easier and easier to get caught up on the ones I do remember. In fact, next week I think I'll jump from monsters to cowboys and talk about a Western I was as a kid and recently watched for the first time as an adult. Giant Fish Invade New York! Quite awhile back, I did posts a week apart respectively titled After the Apocalypse--According to DC (about Kamandi) and After the Apocalypse--According to Marvel (Killraven). Well, I've just realized that I should have had a third part--"After the Apocalypse--According to Gold Key." Because, by golly, Gold Key beat Marvel to the punch in showing us what life would be like after a disaster destroys civilization. 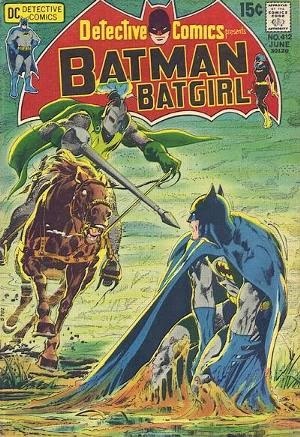 They actually didn't beat DC, who gave us the post-apocalyptic series "The Atomic Knights" a few years before Gold Key wiped out most of mankind. and artist Frank Thorne, began publication in 1964, running intermittently for 20 issues until coming to an end in 1969. Another 11 issues appeared between 1972 and 1976, with one final original story appearing in Gold Key Champion #2 in 1978. Mighty Samson was a mutant with super strength, living in the post-nuclear war city of N'Yark, where his girl friend Sharmaine and her father Mindor are trying to reconstruct the scientific advances lost in the war. Samson helps out by fighting the many savage and primitive mutant creatures that threaten N'Yark's small community. Mighty Samson #20--the last before the book's three-year hiatus--was written by Binder, though Jack Sparling was now doing the art work. It's a typical example of how fun and clever the book was. The streets of N'Yark have been flooded and the human population is soon threatened by fish men, led by the rather violent and power-hungry King Nephtoon. The sea king has his regular troops, but also has control over a variety of monsters. 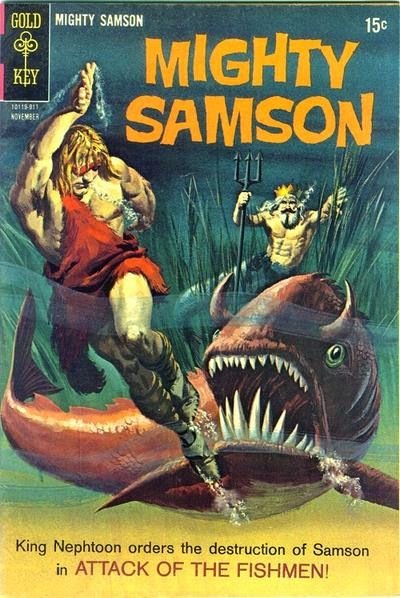 From this simple premise we get a straightforward and well-constructed action-adventure story, with Samson using his strength (and his related ability to hold his breath for a long time) to fight against the invaders. Mindor helps as well, first by suggesting the use of old office equipment to bombard the fish-men from skyscraper buildings, then by digging up some old scuba gear to give Samson greater freedom to take the fight underwater. 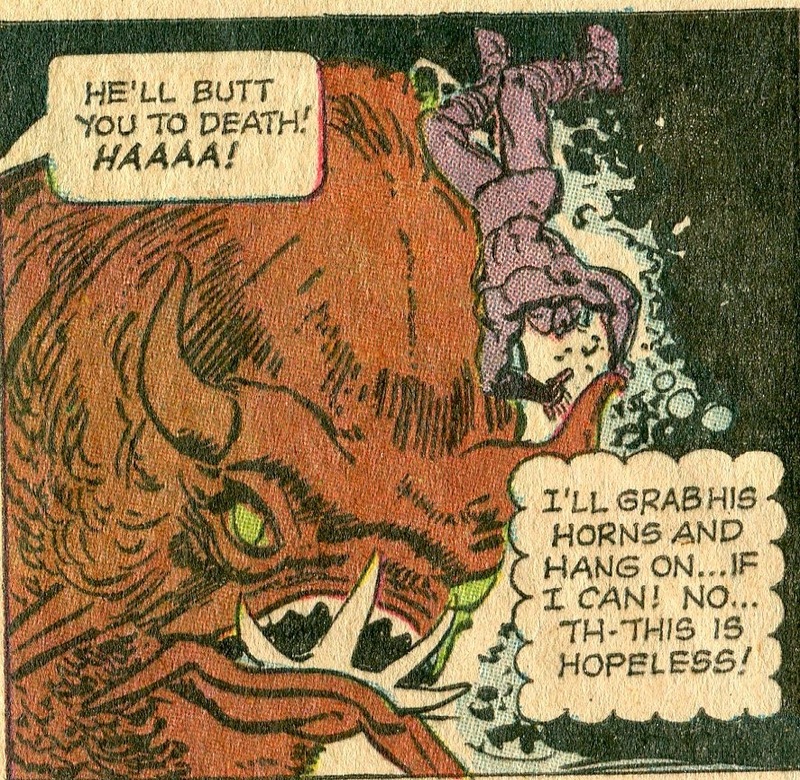 Eventually, Samson is able to capture Nephtoon and force him to call off the invasion. 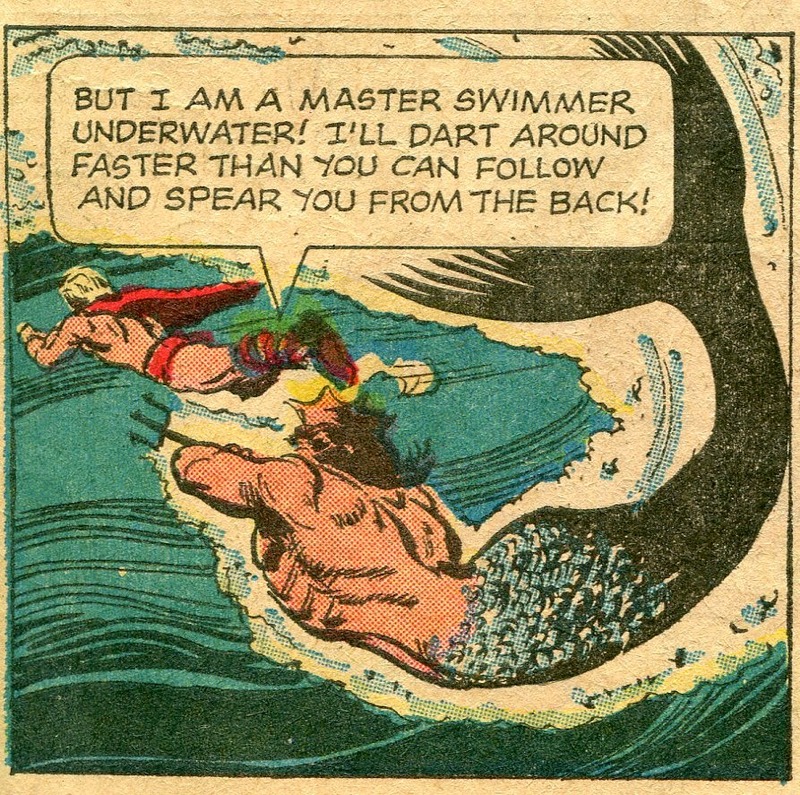 Otto Binder didn't seem to have the same opportunities to indulge in the quirky humor and bizarre plot twists he used so often in Captain Marvel, but his storytelling skills are still top-notch, with this particular tale allowing Jack Sparling to toss several cool-looking sea beasties at the poor humans of N'Yark. Post-Apocalyptic settings in science fiction have become pretty common--it's a genre that was birthed during the Cold War under the real-life threat of nuclear annihilation. Most of these setting are--understandably--rather bleak. Killraven never won a final victory against the Martians; Kamandi never found a home or a safe haven; those darned, dirty apes blew up the world themselves with just a little help from Charlton Heston; and those incredibly annoying zombies keep showing up over and over long after everyone SHOULD have been sick of seeing them. I mean, seriously--stop with the zombie plagues already! But Mighty Samson doesn't just pre-date many of these, it also brings a sense of optimism that other stories in the genre often don't achieve or even try for. Samson is a superhero, still defending the innocent even in a world gone made. Sharmaine and Mindor are trying to rebuild the good that was lost when everything blew up, while the people of N'Yark have formed a viable and healthy community. 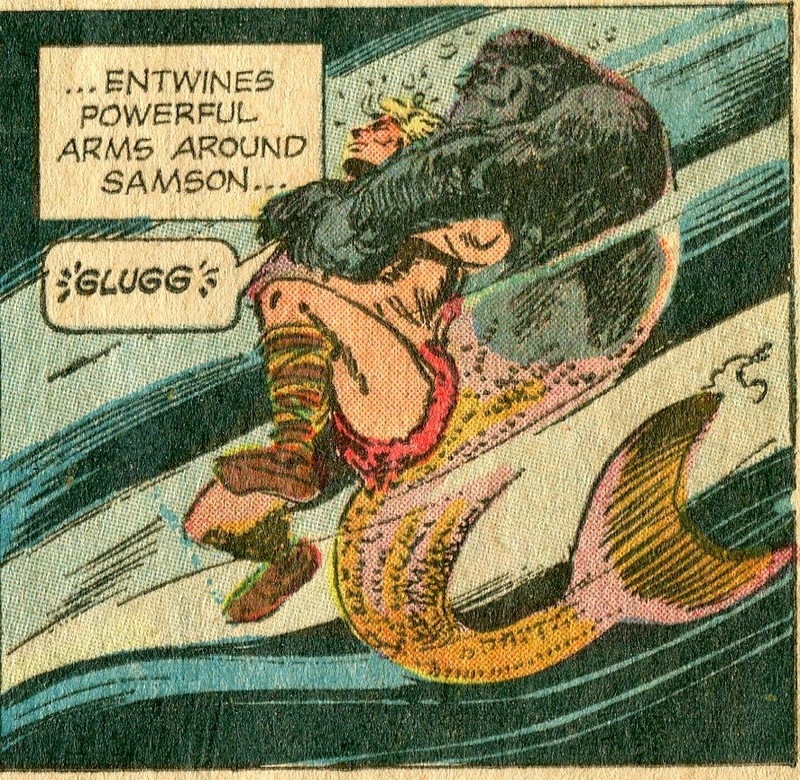 Unlike those apes and Martians and zombies, Mighty Samson leaves us with an element of hope. Well, hope AND really awesome-looking monsters. A great cover from one of the best Shadow novels. A great script by John and Gwen Bagley combines with a great performance by Frank Lovejoy, turning what might have been a contrived story about how greed destroys people into a fascinating and suspenseful character study. The Green Arrow.. No, Darn it! I mean the Green ARCHER! 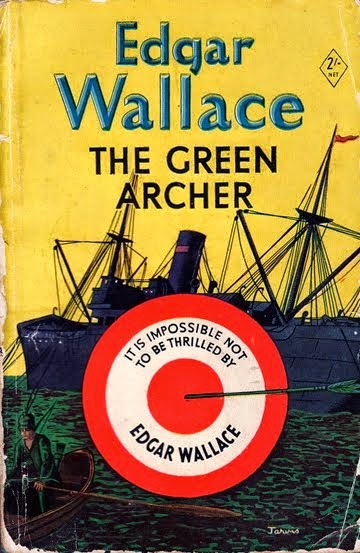 I've discovered that--if you're a comic book geek--it's impossible to tell people about Edgar Wallace's 1923 novel The Green Archer or either of the subsequent movie serials based on that novel without accidentally saying The Green ARROW at least 50% of the time. I have a lifetime of referring to an heroic archer who dresses in green as Green Arrow, darn it. I can't be expected to change now. But the Green Archer is a different character from DC Comics' superhero. You could probably consider him an early superhero--he wore a costume and mask, keeping his identity a secret while taking vengence on villains. Edgar Wallace wrote fun mysteries, full of bizarre twists and turns. 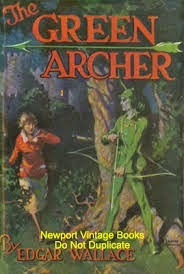 The Green Archer is justly considered one of his best. It definitely has its share of twists and turns, as well as a superbly suspenseful climax involving many of the main characters being tossed into a clever death trap. It's difficult to summarize the novel without giving too much away. The villain is Abel Bellamy, a rich American who has emigrated to England and now lives in the impregnable Garre Castle. He made his fortune in various ruthless and illegal ways and also has a nasty habit of taking vengeance on his enemies by threatening their children. We soon learn that he has been keeping woman prisoner in the castle for the last eight years. Bellamy is villainous enough to require multiple protagonists, including a Scotland Yard detective, a young lady who may be related to the woman prisoner, an American reporter and--surprisingly--a husband-and-wife criminal team who at first work for Bellamy but discover that there are some things they simply won't do for money. The most mysterious protagonist, though, is the Green Archer. Suspected by some to be a ghost haunting the castle, he seems to have full access to that castle no matter how well-guarded it is. He helps foil several of Bellamy's schemes and isn't above putting arrows through the hearts of Bellamy's minions. But his identity and his ultimate motivation is a mystery throughout the novel. It's a lively and enjoyable book. Bellamy is loathsome in just the right way to make him an effective villain. The various good guys are all interesting characters, especially Julius Savini and his wife Faye. This is the husband-and-wife team I mentioned earlier--they begin the book as villains themselves, but to the surprise of everyone including themselves, they develop a tendency to act heroically (though they never do overcome a habit of pocketing any spare cash that might be lying around). 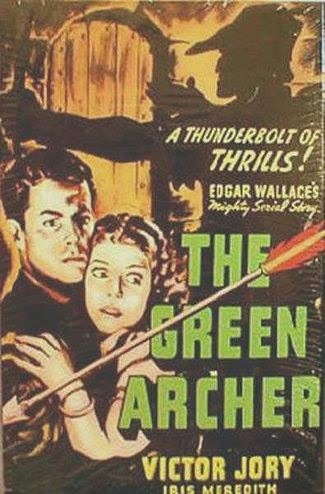 The Green Archer was made into a silent movie serial in 1925, which I haven't seen and I'm not certain if it exists in its entirety. It was made into a serial again in 1940, with the action moved to America. It is an excellent serial, with Victor Jory playing Spike Holland--the American reporter from the novel who is promoted to lead protagonist here. James Craven does a wonderful job as the villainous Bellamy. The story departs from the novel and is largely an original story, but its a good one. There are some great cliffhangers, often involving insidious death traps. In the serial, anyone who doesn't figure out the Green Archer's identity early on isn't really trying, but there are some fun twists involving the motivations of other characters in the last chapter. But the original novel is still the best version of the story. It hasn't been in print for years, but The Green Arro.. no, darn it! The Green ARCHER is available online HERE. Incompetent Alien Invaders and a Mom who Needs to be Put in a Home. 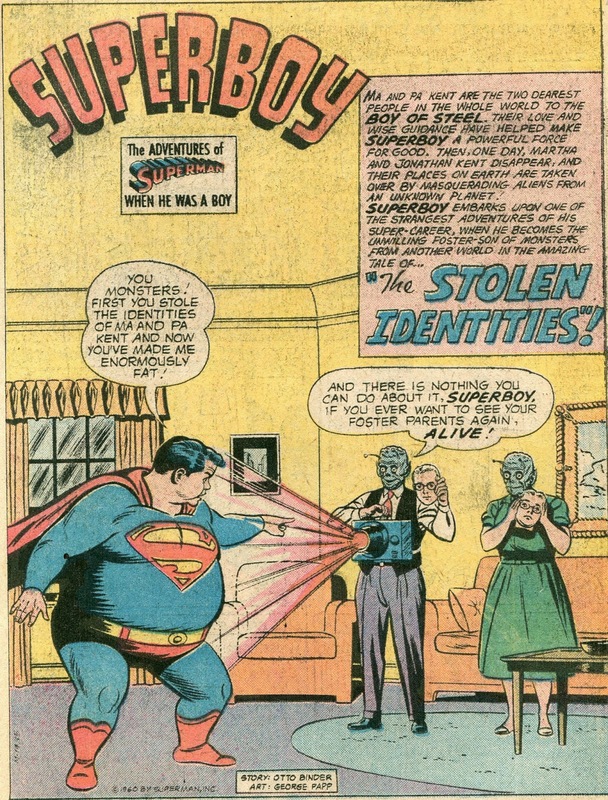 The above image is the first page of a Superboy story titled "The Stolen Identities," first published in Adventure Comics #270 (March 1960). I'm tempted to say that the story subtly represents any teenager who feels disconnected from his parents or feels they are ruining his life. You could also look at how the aliens do their jobs so poorly and call the story a condemnation of inefficient government bureaucracies. But I'm not going to go there. It's not impossible that writer Jerry Siegel was consciously dealing with teenage angst, but I would guess that he was primarily just trying to have fun. And in that, he succeeds. This story is quirky, silly fun from start to finish. By the way, I own this story as a reprint in a 1976 book titled Four Star Spectacular. The story there is credited to Otto Binder. This is apparently a mistake, as every other source I check--including the DC wiki and the Grand Comics Database, credit it to Siegel. I can understand the error, though. The quirkiness of the story does give it an Otto Binder feel. It all begins with Ma and Pa Kent being teleported to an alien world. The assumption at first is that they are now in another solar system. But actually, they are on a sub-atomic world located somewhere on Earth. A couple of aliens disguise themselves as the Kents and return to Earth. Their mission is to locate the atom on which their world exists and take it some place safe. 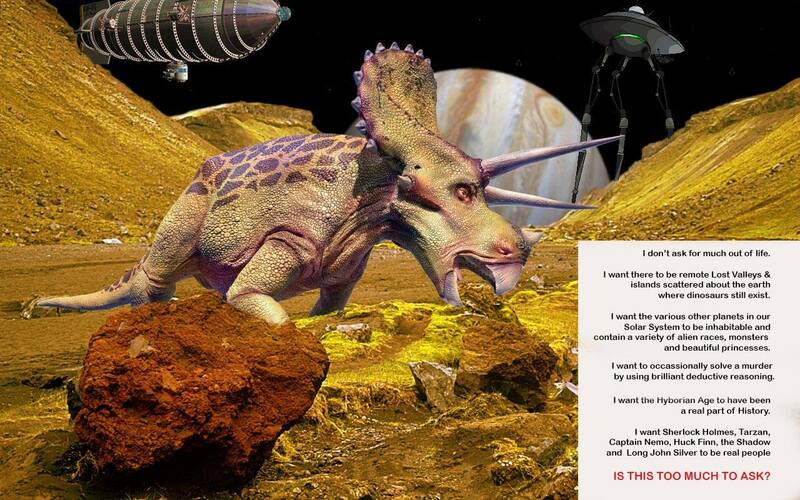 It's a reasonable mission, but they don't trust us Earth people enough to ask us for help. The aliens soon prove to be rather ineffectual. Despite having observed the Kents long enough to be able to create perfect disguises, including voices and mannerisms, they completely missed the fact that the Kents' son is the most powerful being in the world. Also, their teleporter breaks down, so they can't ask for reinforcements. They finally give themselves away when "Pa Kent" mistakes the toaster for his breakfast and tries to eat it. Sadly, us Earth people aren't looking that good either. Ma Kent blurts out of nowhere that Superboy is vulnerable to Kryptonite. Yes, Clark, it's time. Sad as it is, it's time to start looking into an assisted living home for your parents. The aliens find some Red Kryptonite without knowing this isn't the deadly kind and load it into a ray gun. 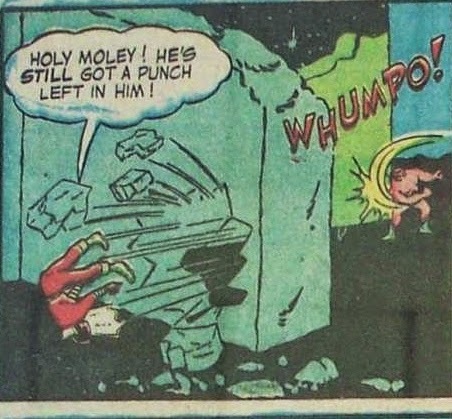 They repeatedly zap Superboy in hopes that they'll destroy him, but instead the Red K just does a series of bizarre things to the Boy of Steel. 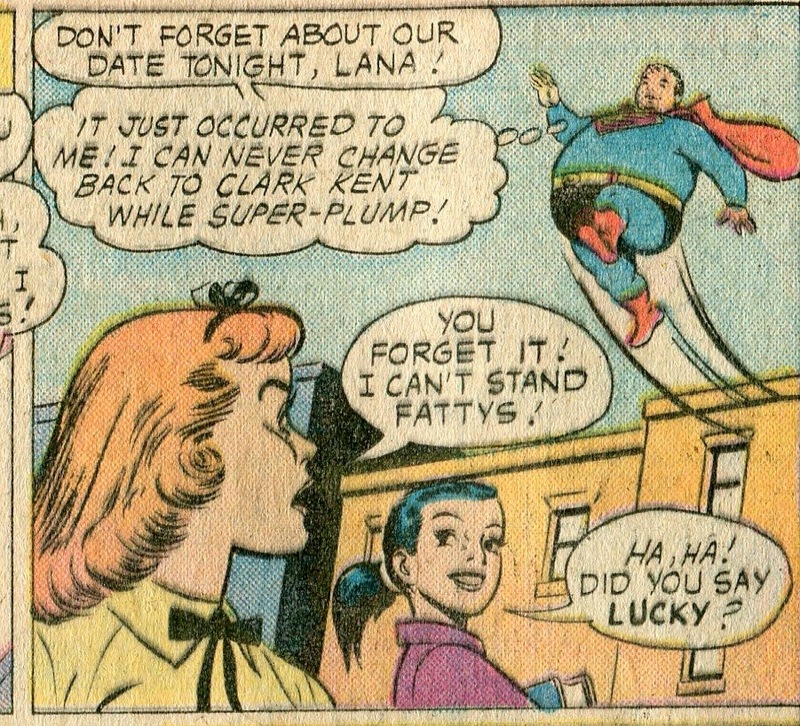 First he's turned fat, which costs him a date with Lana. (Gee whiz, Lana, a bit shallow there, aren't you?) Then he's turned tiny. Then he's turned into a giant. I actually think there's a continuity error here concerning Superboy's mythology. A particular piece of Red K is only supposed to affect him once. But maybe the alien ray gun altered the radiation somehow, so what the heck. While all this is happening, Superboy learns about the atomic world. Using his Super Vision, he locates the appropriate atom at the top of the Empire State Building and gives it a safe resting place at the bottom of the ocean. The aliens are grateful and, after finally repairing their teleporter, send the Kents back home. I love this story. Yes, it's silly, but it unashamedly embraces its silliness and jumps wildly from one plot point to another--but does so without ever seriously violating its own internal logic. 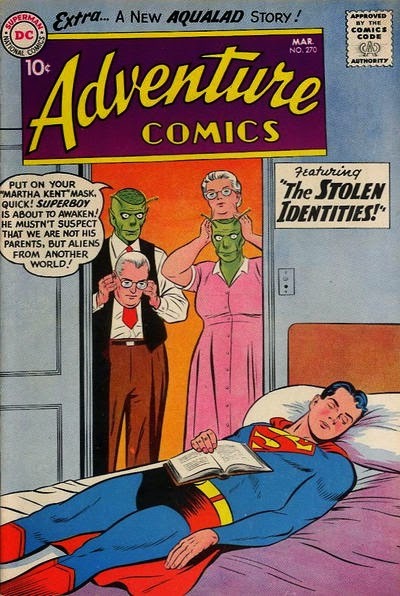 Stories like "The Stolen Identities" are models for why I love comic books from this era. These are stories that knew a superhero universe could never truly be realistic and that it was wrong to even try to make it so. These are stories that will walk down whatever path Comic Book Logic leads them, holding their heads high, feeling neither shame nor embarrassment as Superboy gets turned into a fat kid by aliens pretending to be his parents. Batman isn't in a position to send his uniform out to be professionally cleaned. So how much of his day does poor Alfred have to spend scrubbing the darn thing clean? Following a husband to find out if he's stepping out on his wife should be a simple job. But this one soon snowballs into a confusing case that includes Shayne being beaten, kidnapped, framed for murder and stalked by a killer with a sawed-off shotgun. All in a day's work for the tough detective. I love those moments when I have some spare time and nothing to do; when I can pick up a short novel that I know can be read in less than two hours, lay on my couch and read it start to finish. That's the best way ever to relax. It might be a novelization of a Dr. Who television serial. It might be an early 87th Precinct novel by Ed McBain (These were written for the paperback novel in the 1950s and were required to be exactly 180 pages long by the publisher.). It might be a pulp novel from the 1930s or 1940s. 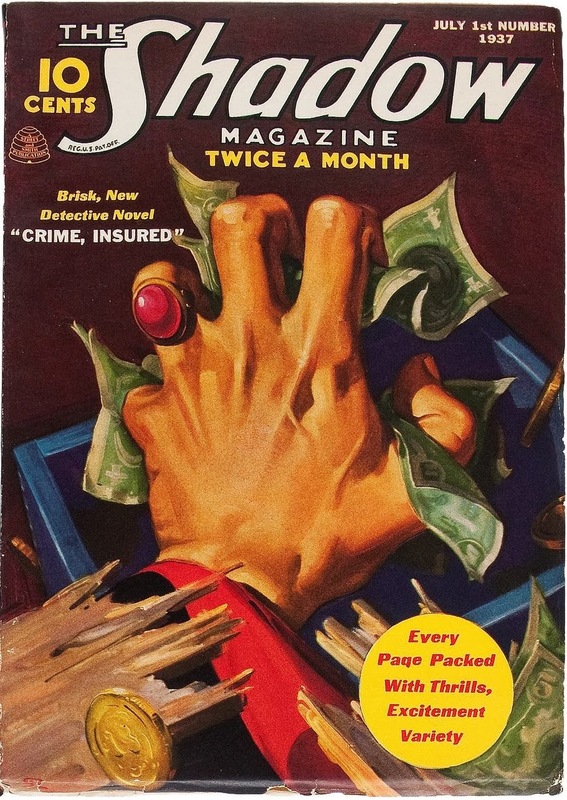 The night before I wrote this post, it was The Vanisher, a Doc Savage novel from the December 1936 issue of Doc's magazine. Typical of author Lester Dent's best stories, it starts off with a bang and races through a series of bizarre plot twists and exciting action scenes before reaching its conclusion. This one starts out with a prison break. 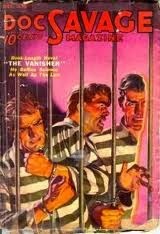 A hunchbacked man (or woman--no one is ever quite sure) sneaks into the prison and breaks out twenty men who have all claimed to have been framed by an all-powerful criminal syndicate. He replaces them in their cells with twenty executives from various insurance companies, none of whom know how they got there. It's also a mystery how the convicts got out of the prison. 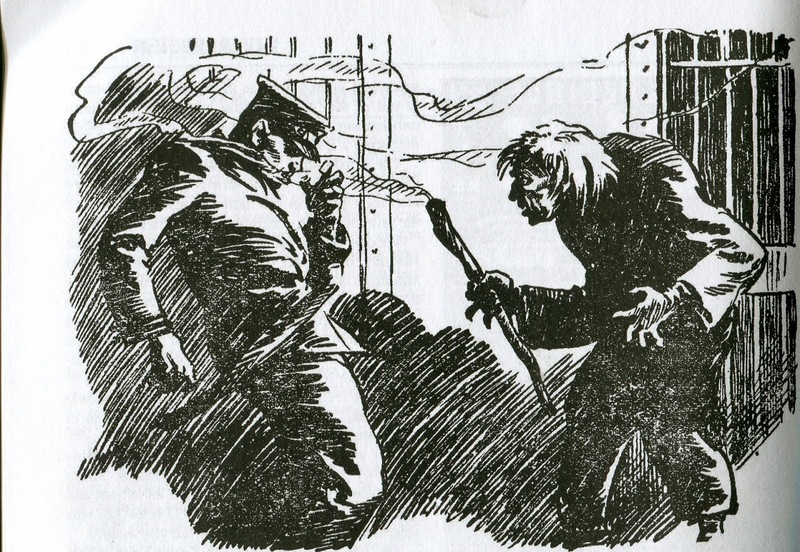 And strange escapes happen throughout the story, with the hunchback or the escapees disappearing from rooms without a trace. Doc, Monk and Ham get involved fairly early. Doc visits the prison to investigate the mass escape, but a woman disguised as a reporter tries to kill him with a gun-rigged camera. But even her motivation is up in the air--is she a villain or is she being forced to work for the villain? On top of all the, the insurance guys who had mysteriously turned up in the prison cells after the escape keep popping up unexpectedly, shooting at pretty much everyone with shotguns and machine guns. Doc gradually sorts things out, though at one point he's framed for murder and on the run from the cops himself. 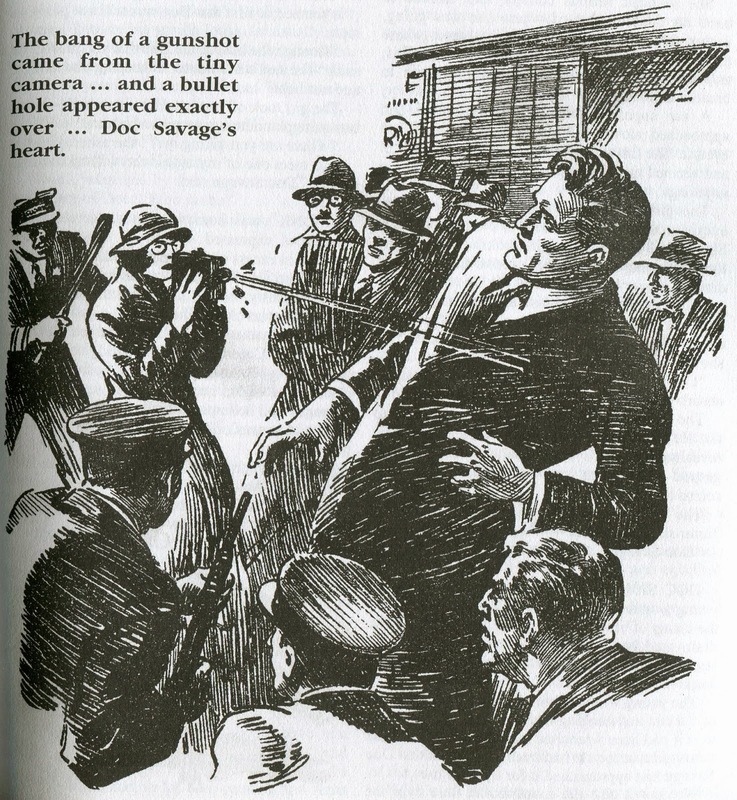 But, as is typical of the best Doc Savage stories, when the villain thinks he is one step ahead of Doc, it always turns out that Doc is actually two steps ahead of him. If I were to quibble, I'd have to say that the conclusion of this story is too abrupt to be completely satisfying, but it is in toto a wonderfully exciting and appropriately bizarre Doc Savage story. It is, in other words, the perfect way to spend 90 minutes. DO NOT mess with the nanny! You see that wild-eyed young lady up there? 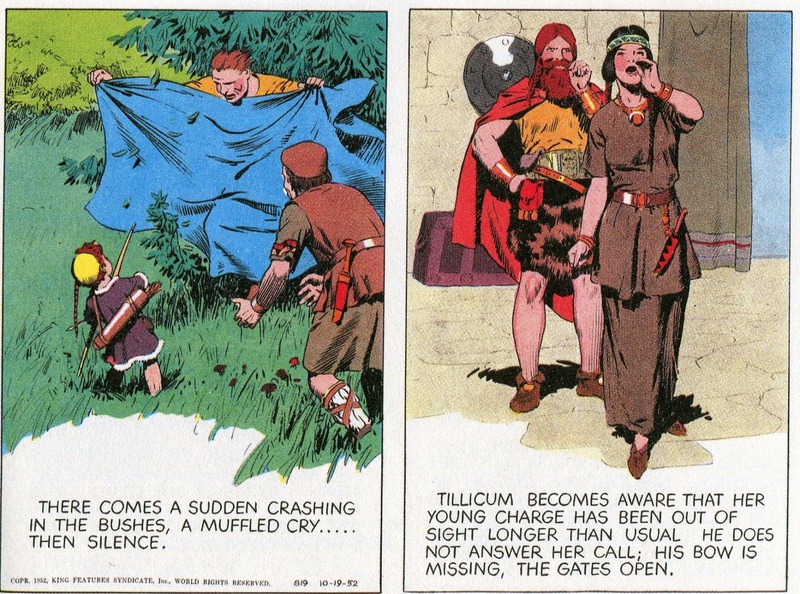 That's Tillicum, an Indian lass who (through a series of odd adventures) ended up in King Arthur's England, helping take care of Prince Valiant's first-born son Arn. 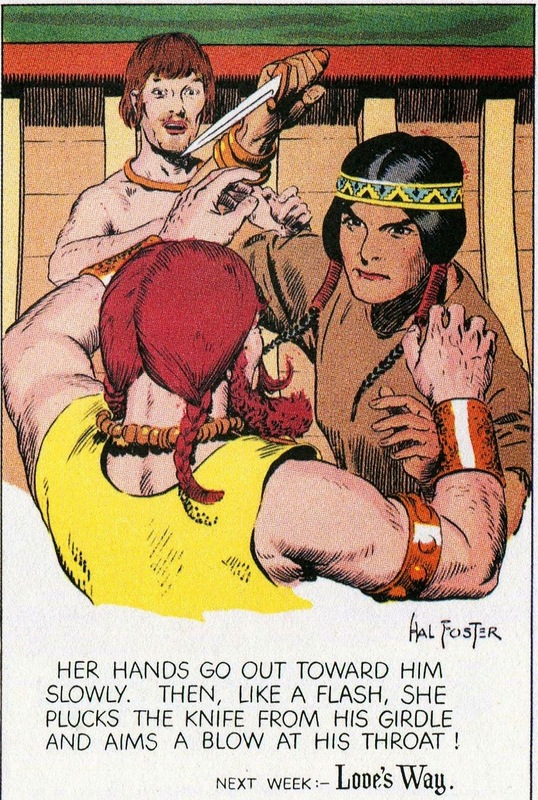 The guy she's trying to knife to death is Boltar, a Viking warrior and her future husband. You do NOT mess with Tillicum. Even if she's in love with you, it's not a good idea. And if you mess with one of her loved ones--well, there are easier ways of committing suicide. Tillicum's Crowning Moment of Awesome is in a story arc from late 1952. By this time, she and Boltar are married and they've been allowed to bring Arn home with them for a visit. But the little scamp manages to wander off on his own, where he gets kidnapped by a band of villains. She soon realizes that Arn is missing. Here, her considerable skills as a tracker come into play. Subtle clues (a crushed blade of grass--a torn spider web--a brook with the mud stirred up) soon tell her what happened and put her on the trail of the kidnappers. But there was no time to return to her husband for help. Tillicum is on her own. Which actually isn't a problem for her. Knowing Boltar will be searching for her soon, she leaves a clear trail behind her while closing in on Arn and the bad guys. When she catches up to them, she sneaks into the camp at night to free the boy. You'd think that would be enough to satisfy her, but remember that you simply do not mess with anyone that Tillicum cares about. While escaping from the camp, she deliberately leaves a trail that the kidnappers can follow while she doubles back along the route Boltar will be traveling. When they catch up to her, she empties a saddle with her a well-placed arrow. Boltar arrives in time to take out another villain with a thrown axe. The story arc is a short one--running just five Sundays. But it is truly epic. 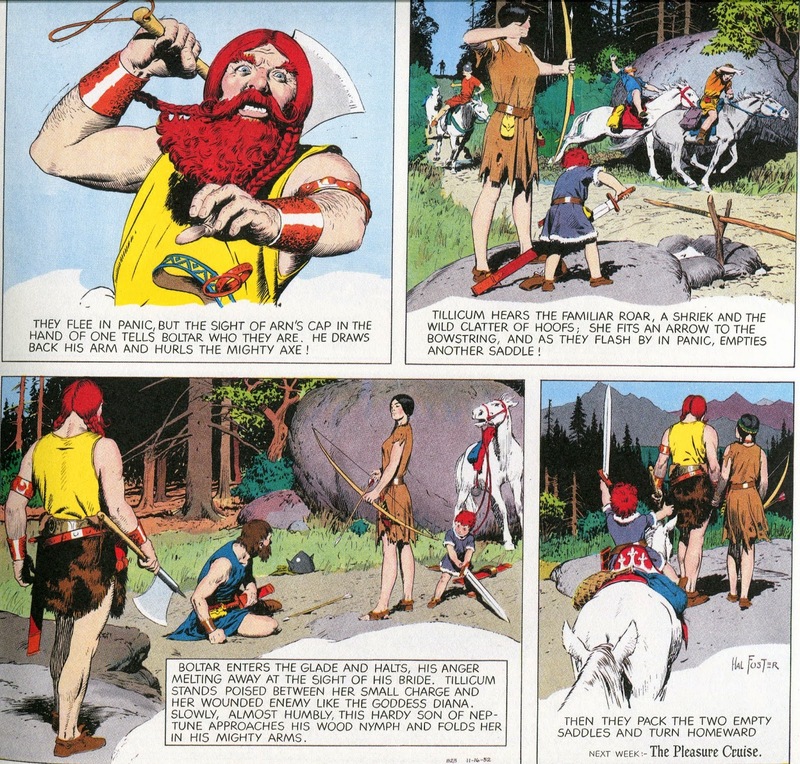 Hal Foster was a magnificent storyteller, combining perfect art with well-written narration and characters who can only be described as glorious. Regular readers of the strip would have already come to love Tillicum in earlier appearances for her bravery, loyalty and intelligence. Her tempestuous courtship with Boltar had been touching, funny and oddly believable. 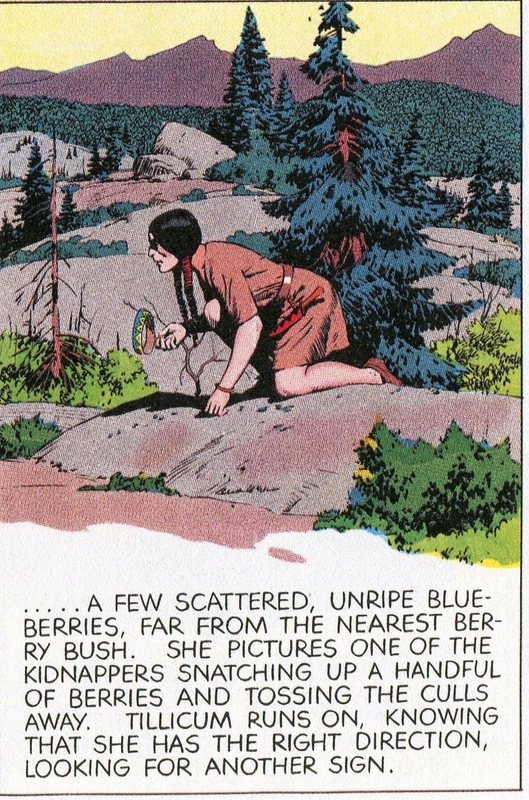 And here her own short but dazzling adventure cements her place as one of the most memorable supporting characters in Prince Valiant's long run. 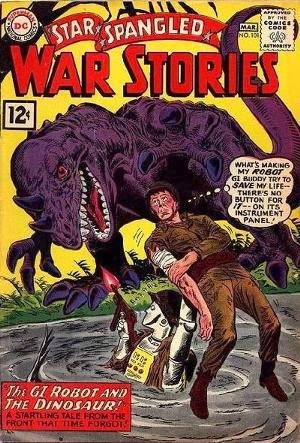 Robots, dinosaurs and World War II. It's the perfect triumvirate of classic nerdiness. A grim story set during the Mau Mau rebellion in Kenya, with the tale leading up to a horrific and effective conclusion. "Be brave and pure, fearless to the strong and humble to the weak." 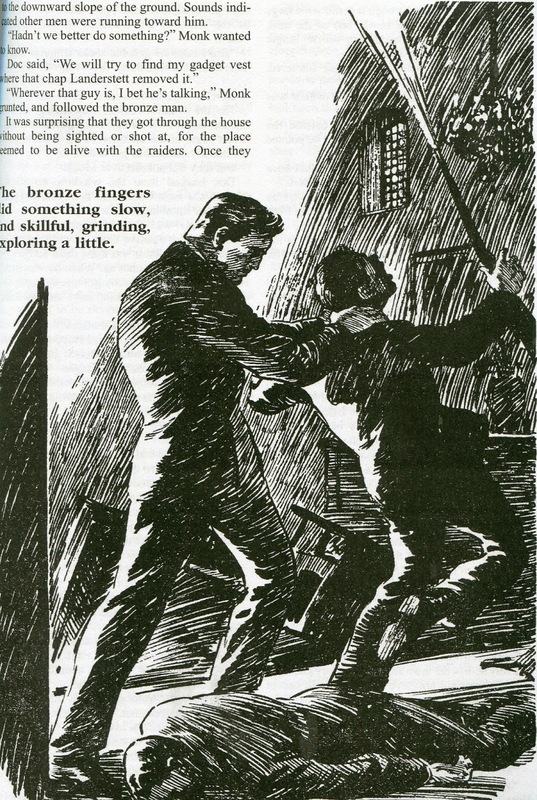 It's well-known that Arthur Conan Doyle didn't want to write as many Sherlock Holmes stories as he did--he tired of the Great Detective and, besides, all the furor over Holmes was taking attention away from his historical novels. It was these that Doyle was most proud of. And with good reason. 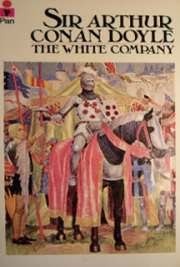 The White Company (1891), for instance, is absolutely epic. It's set during the years 1366/67, right smack in the middle of the Hundred Years War--in which England and France are fighting over control of France. The novel's protagonist, though, isn't a soldier. At least not at first. Alleyne Edricson was the younger son of a nobleman who had been raised in a monastery. As the novel opens, we learn that he would just as soon stay there--content with a quiet life of religious observance. But part of the deal his now-dead father had made was that he would go out into the world for a year before making a final decision. This leads Alleyne into adventure, war, danger, and the constant threat of death. He turns out to be pretty good at that sort of thing. Doyle makes all of these characters seem real, giving them vivid personalities and believable motivations. Sir Nigel is especially notable--a small man getting on in years and with weak eyesight, he's still the best swordsman in Europe and he represents the best aspects of chivalry--always eager to gain honor in combat, but conscious of his duty to his king, his country and those who serve under him. A less talented author would have turned Sir Nigel into a wooden stereotype. Doyle presents him to us as a living, breathing person who just happens to be an epic hero. 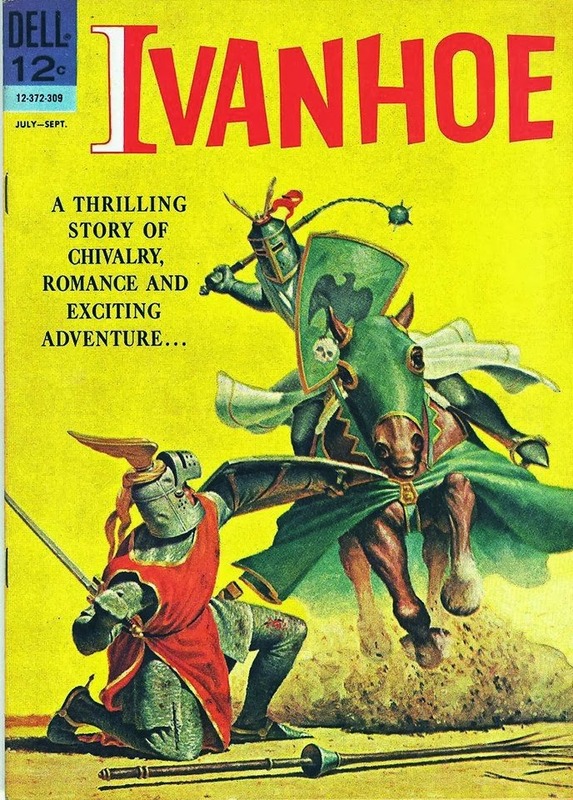 My favorite knight would still have to be Sir Roger de Tourneville, but Sir Nigel gives him a run for his money. It's a pretty close call. Nigel's also got a beautiful, tempestuous and intelligent daughter. Alleyne falls in love with her, which means he'll have to prove himself to be worthy of knighthood before he can ask her hand in marriage. He'll get plenty of opportunities. 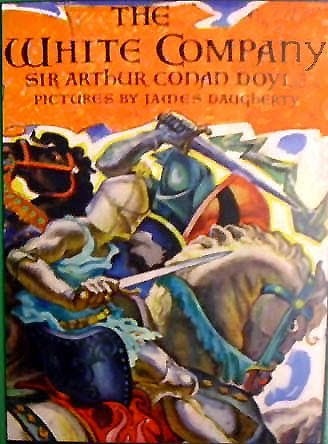 About two-thirds of the novel consists of Sir Nigel and his companions traveling to France to meet up with the White Company, but they have plenty of adventures along the way, including a fight against a pair of pirate ships while crossing the Channel and the desperate defense of a castle keep against a blood-mad band of peasants. But as wonderfully exciting as all that is, nothing that comes before matches the battle scene that comes at the novel's climax. The White Company, greatly outnumbered, defends a hill against an overwhelming force of French and Spanish troops. It is one of the most intense and thrilling battle sequences I've ever read. There's a lot of other aspects to the novel that make it so good. 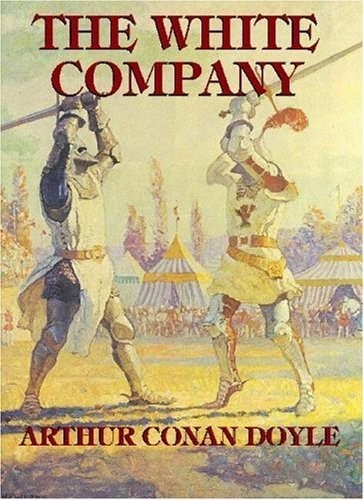 Colorful supporting characters; moments of true humor; small vignettes that give us a panorama of 14th Century life on many levels; prose that uses archaic grammar and is peppered with obscure words, but still flows along smoothly and is often a joy to read. 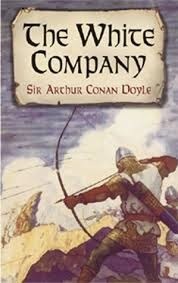 So I don't blame Doyle at all for saying that The White Company was worth 100 Holmes stories. I don't agree--I'm not sure Doyle ever fully appreciated just how awesome Sherlock Holmes is. But his historical novels should also be remembered fondly. They are the stuff that legends are made of. You can access the novel online HERE. 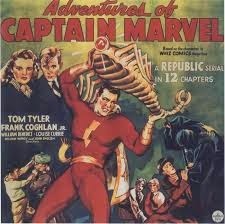 The first and still arguably the best superhero serial was 1941's The Adventures of Captain Marvel, with a fun story, great special effects, and some tense cliffhangers. And it might have been the success of the serial that convinced writer Otto Binder and artist C.C. Beck give the format a try within the pages of Captain Marvel Adventures. What they come up with is one of the classic stories of the Golden Age. "The Monster Society of Evil" is epic in scale, full of Binder's quirky humor and sense of adventure, all supported by Beck's perfect artwork. 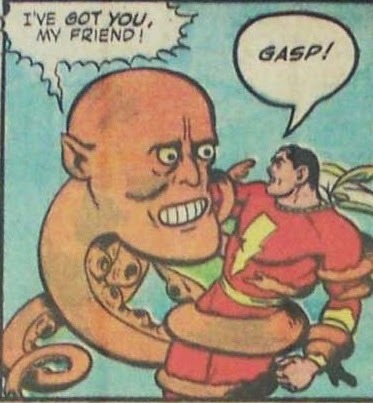 It brings all of Captain Marvel's arch enemies into one single plot to help the Axis win World War II--all of whom are being commanded by a new extra-terrestrial villain known as Mr. Mind. Who is Mr. Mind? Well, most readers interested in my blog almost certainly know already, but imagine how much of a surprise and a delight he must have been to young readers in 1943. I don't think there had ever been a villain quite like him. There probably hasn't been a villain quite like him since. 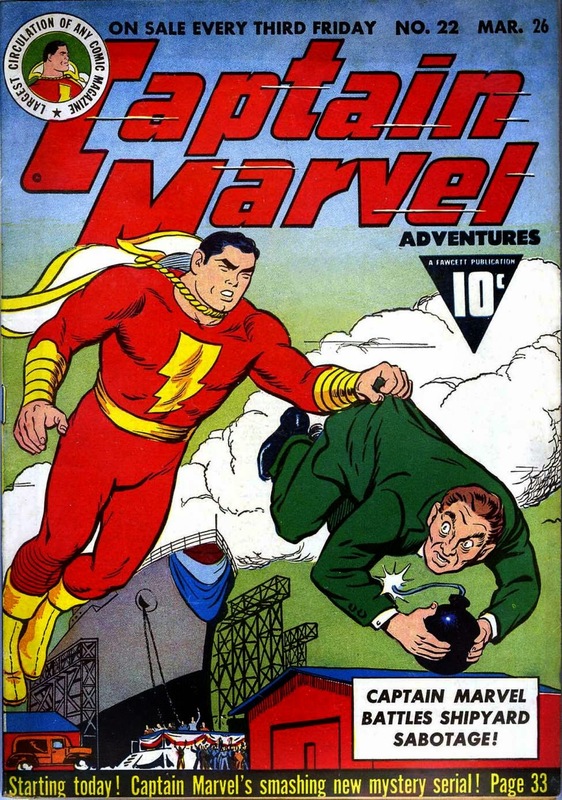 It all began in Captain Marvel Adventures #22 (March 1943) and would run for two years and 25 chapters before coming to an end. It opens with a princess from India delivering one of two magical black pearls to the Allies. Put the pearls together and you can "pick up scenes and voices from anywhere," making it a valuable espionage tool. The princess is promptly kidnapped by Captain Nazi and taken to India to recover the other pearl. Captain Marvel pursues. This starts a fast moving series of adventures. 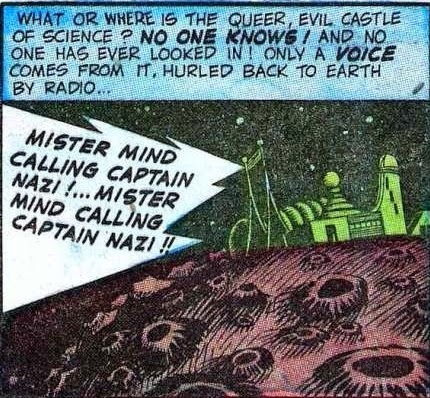 Soon, Captain Nazi is captured, but another villain Ibac gets away with the pearls. Ibac is a great idea for a bad guy. He's normally an elderly and wimpy criminal named Stinky Printwhistle. But after a deal with the devil, he can say the name Ibac and become a super-strong man with the power of flight. Ibac, by the way, comes from Ivan the Terrrible (terror); Cesare Borgia (cunning); Atilla the Hun (Fierceness); and Caligula (cruelity). This moves the action to North Africa, where Ibac plans to sabotage the Allied military there. 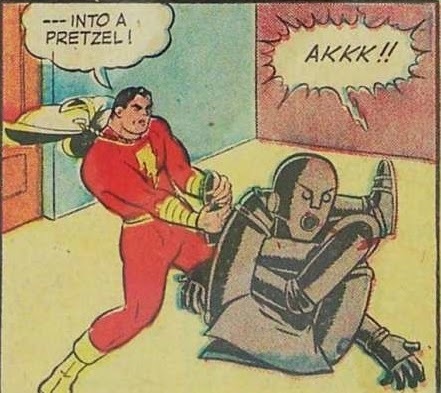 Captain Marvel puts the kibosh on this, but the pearls are aquired by Nippo, a Japanese spy. This brings the action of Hawaii, where Nippo tries to destroy Pearl Harbor by activating a dormant volcano. 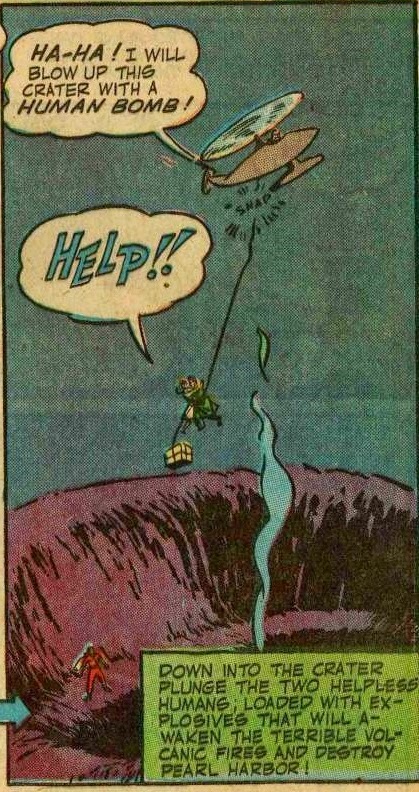 The spy is soon caught and Captain Marvel recovers the pearls. But Mr. Mind and the other villains are still out there somewhere. Dr. Sivana pops up next, using a huge machine to alter the Earth's axis and bring on a new Ice Age. 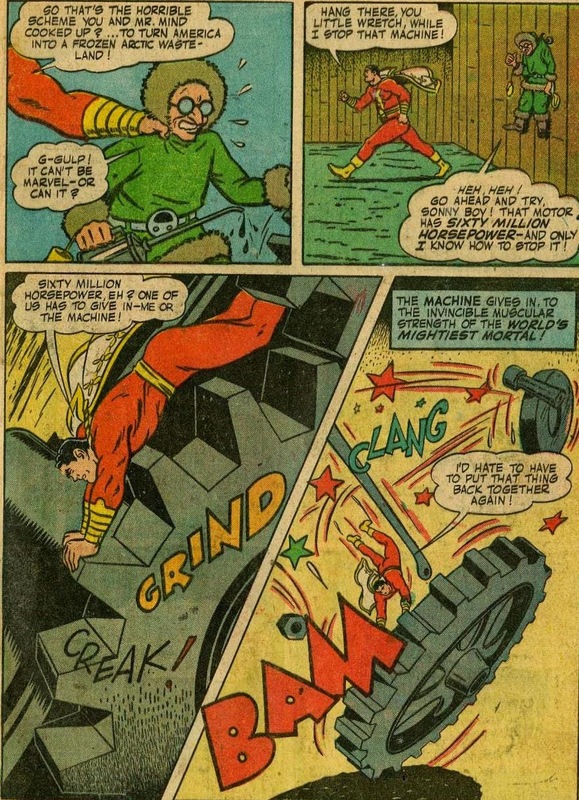 Using the pearls to track the mad scientist down, Captain Marvel destroys the machine. In a wonderful plot twist, Marvel belatedly realizes only then that he has to repair the machine and run it backwards to put the Earth back where it belongs. 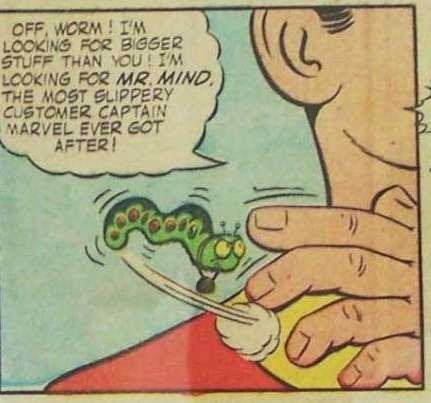 By now, Captain Marvel knows that the mysterious Mr. Mind is running the show from behind the scenes. 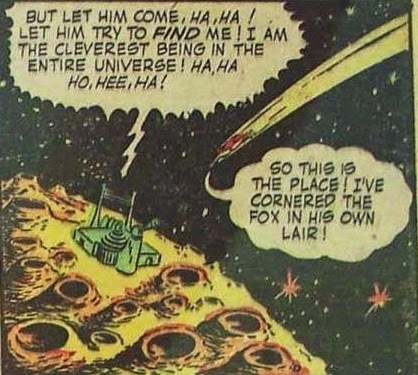 He tracks the villain to a dead planet located near the Moon. Marvel flies there and confronts Mr. 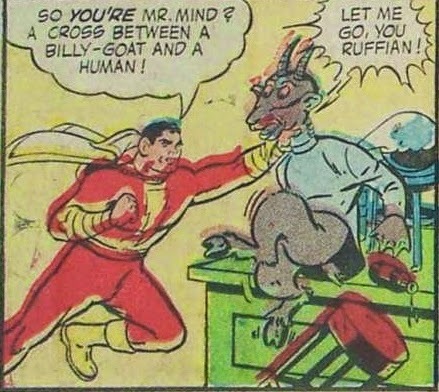 Mind--who is an alien creature with a goat head. Except he's not--that's just a minion into whom Mr. Mind projected his consciousness. The real Mr. Mind is a robot. Oops. No he's not. That's another minion. He must be this hideous octopus creature. No, perhaps he's this super-strong humanoid (with whom Marvel has an epic fight that destroys Mr. Mind's base). No, he's not ANY of them! The real Mr. Mind escapes in a space ship to continue his villainous schemes. So Marvel still has no idea who Mr. Mind really is. And, despite having the wisdom of Solomon, he doesn't give a second thought to that tiny worm that dropped down on his shoulder at one point. This covers the first five chapters (issues #22 through 26), all fun stories which--like all great serials--it fast paced and exciting from start to finish. My favorite of the five is probably from #26, in which C.C. Beck's vivid imagination is unleashed to create a series of magnificently designed minions for Mr. Mind. But this IS just the first five chapters. As is traditional with all good cliff hangers, I'm going to break off here and wait a few weeks before returning to the story with a look at parts 6 to 10. In the meantime, the Monster Society of Evil is available to read digital at Comic Book Plus. Start with Captain Marvel Adventures #22 and read on from there.